As alternative biochemistries go, a fair amount of both serious science and science fiction has suggested the idea of silicon based life — life which uses silicon to form its main structures as opposed to the carbon that makes up life on Earth. After all, despite the fact that carbon-based life is the only kind of life we know of, it would be blinkered to assume that no other life is possible. In his book, The Cosmic Connection, Carl Sagan coined the phrase “carbon chauvenism” to describe such assumptions. It’s an interesting concept to think about, largely because of how utterly alien silicon-based life could be! The basic assumption behind the idea of silicon-based life is simple. Silicon sits right underneath carbon in the periodic table, so it should have similar chemistry. The two certainly do share a few things in common — both can form four bonds, both are reasonably reactive (but not too reactive) and both have fairly extensive chemistries. For instance, both react with hydrogen to form methane (CH4) and silane (SiH4). Sadly for silicon, there are a lot of ways in which it’s simply not as good as carbon. The biggest difference is that carbon can catenate. In other words, it can form strong chemical bonds with itself, meaning that carbon can form rings, chains and cages in all manner of shapes and sizes. The number of possible structures that carbon can make is theoretically infinite, given enough carbon atoms. Silicon, on the other hand, doesn’t much like to catenate. Silicon-silicon bonds are relatively weak, so silicon chains are unstable. So much so that, at least under Earth-like conditions, it’s extremely difficult to form any silicon chains at all. Let alone rings or anything else. Disilane will actually combust spontaneously in air. Water too, will break it apart (forming silicic acids). Also, as I found out previously, silicon isn’t even too fond of bonding with carbon. Even considering the possiblity of siloxanes (chains made up of silicon and oxygen), there’s one other big fact standing in the way of silicon biochemistry. Earth’s crust is full of silicon. Oxygen too. Actually, Earth is rather odd in the Universe, in that it contains much more silicon than carbon. Given that life chose carbon anyway and mostly ignored silicon is surely an indicator that either silicon is unsuitable, or that carbon simply works better. 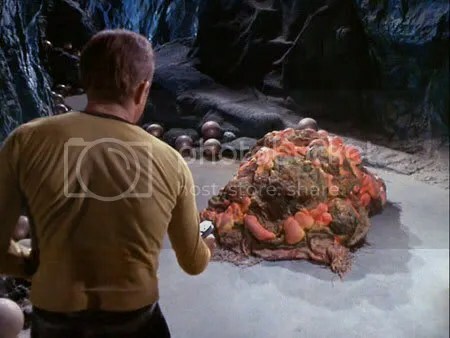 So it’s unlikely we’ll find anything like the Horta living on any of these new planets being discovered. Sorry Trek fans. It’s worth mentioning though, that while Earth life isn’t actually based on silicon, some life does use it. Diatoms create their tiny but beautiful shells out of silica. Even you and I contain silica. This entry was posted in astrobiology, chemistry, Imported from Livejournal. Bookmark the permalink.